・Speedy roll-up operation is possible since the reduction ratio is 1 to 1. ・Highly sealed dust prevention type with excellent workability and functions. ・Since the reduction ratio is 4 to 1,women can easily roll-up the poly. ・Highly functional compact side roll-up type ventilating unit with excellent air tightness and workability. ・Roll-up type ventilating unit for high places. ・The reduction ratio is 2 to 1. 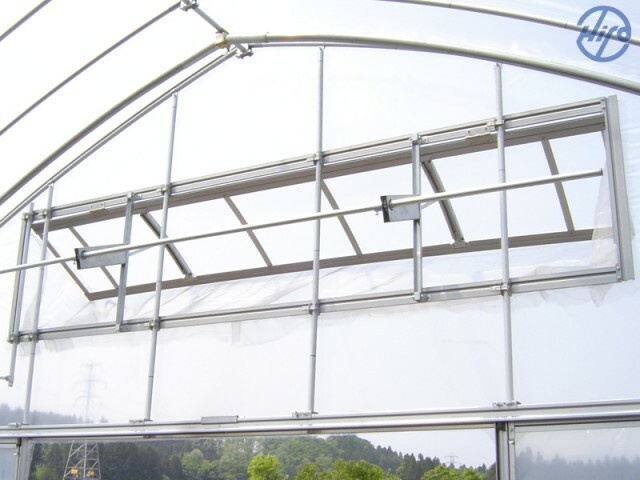 ・Since the unit is housed in an aluminum body,it is resistant to rain and rust. ・The reduction ratio is 4 to 1. ・Easy to ventilate by just pulling down the string of the end panel. ・Opening and closing angle can be free. ・Installation is easy by using 4 HIRO PIPE JOINTS. 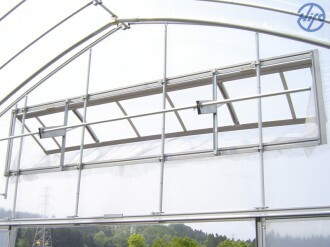 ・The end panel can be coverd with one plastic film. ・Can use INSECT NET if you want. 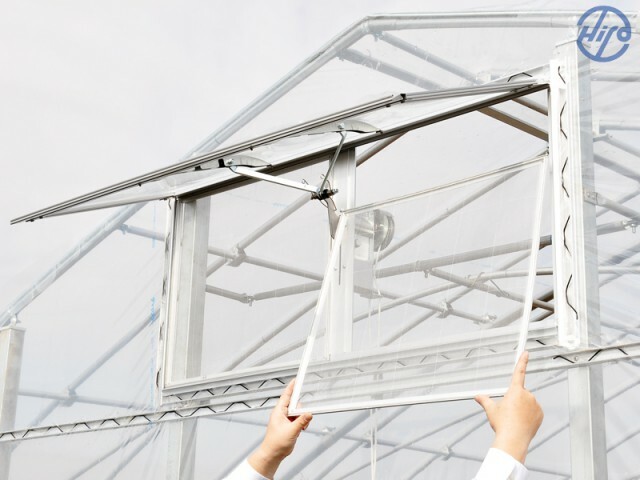 ・Since the window is prefabricated,installation is simple by means of new pipe joints fastened at 4 places. 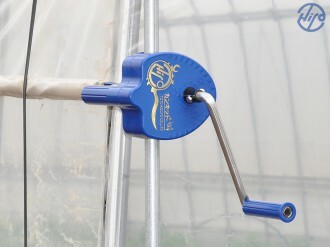 ・Three stages of opening and closing angle can be selected by simply pulling a string. ・The window frame is of pre-painted steel TSUYUTORU structure with principal parts of stainless steel for sturdiness and durability. 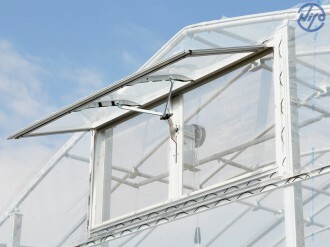 ・The window frame can be easily covered with one plastic film cut at the edges. 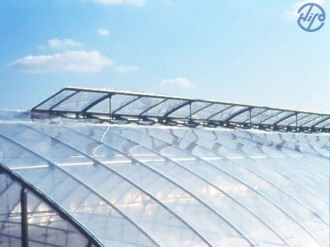 ・Optimum for greenhouse with large end. ・Opening or closing angle can be freely selected by using NEW TANIKANKIT 102. 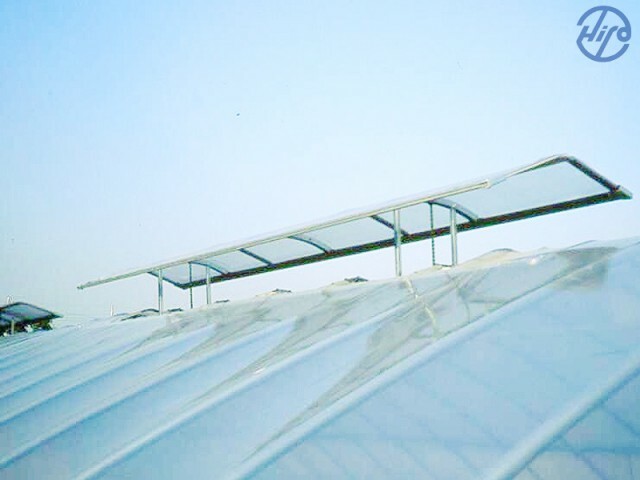 ・Covering with one sheet of plastic film is possible. ・Highly corrosion resistant Color Vinipet or Color TSUTYTORU is used for the window frame. ・Easy to ventilate by just pulling down the string of the roof. ・Opening and closing angle can be 2 type. ・The can be coverd with INSECT NET. 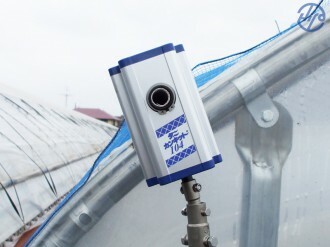 ・This full-scale airtight skylight ventilation system can be realized in any type of pipe house. ・Installation in a new house with a set of parts naturally possible but also can be easily installed in an existing house. ・The new opening oand closing mechanism of the sky window is smoother than the conventional type. 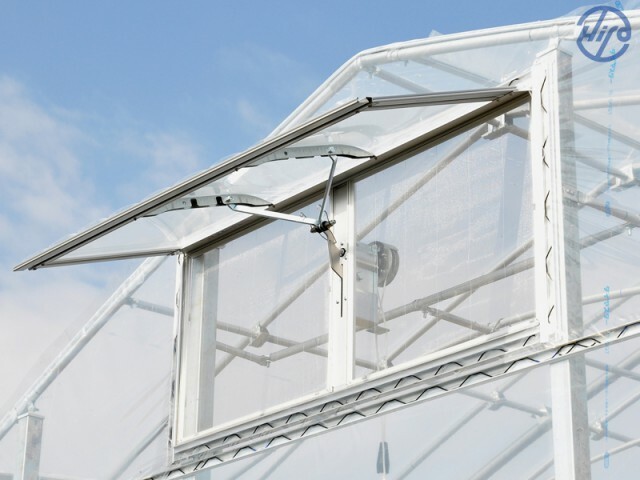 ・The sky window frame is security mounted and greatly improves the structural strength of the house. 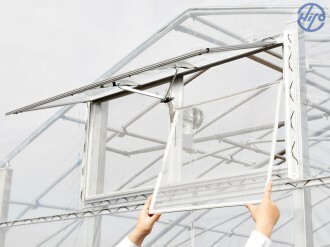 ・Pre-painted steel plates are used for the horizontal cross pieces of the sky window frame for excellent durability. 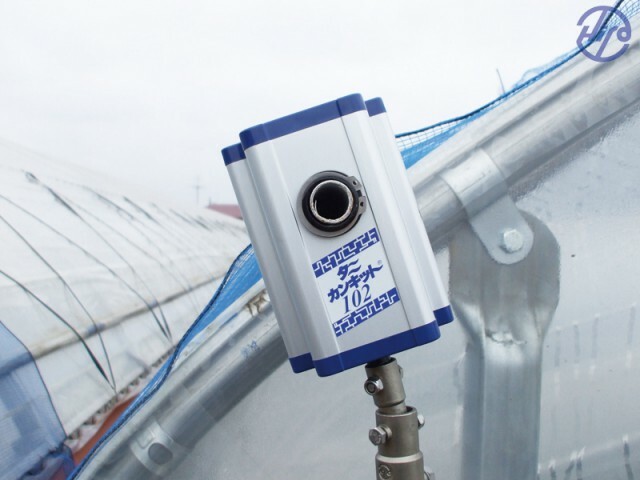 ・Effective blowby system in ridge portion provides excellent ventilationg effect. 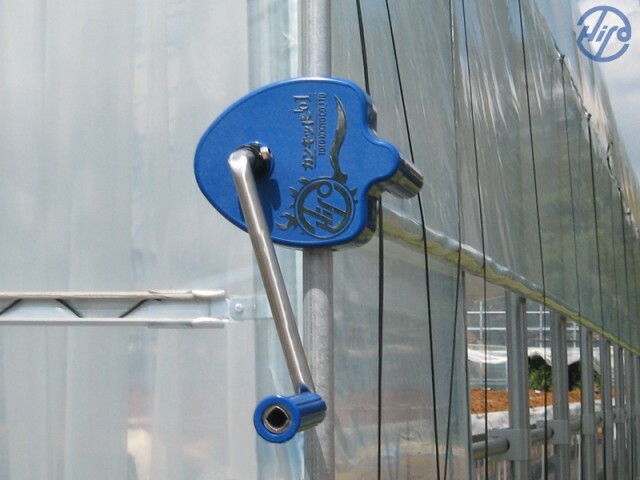 ・Specially designed vertical moving mechanism ensures smooth opening and closing. 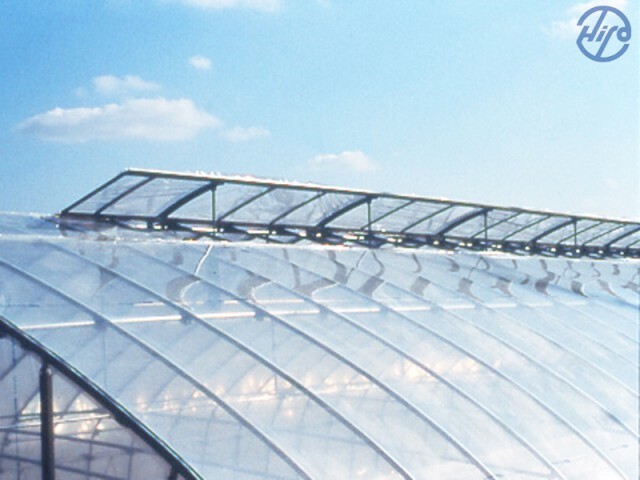 ・Can be installed in any type of greenhouse. 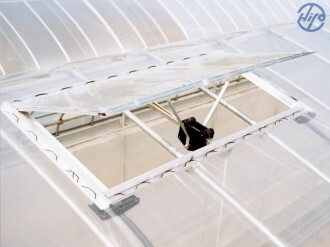 ・A　single skylight system or continuous skylight system can be installed. 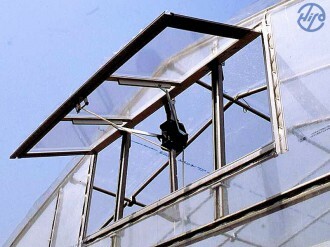 ・Highly durable pre-painted steel plates are used for the sky window cross pieces.